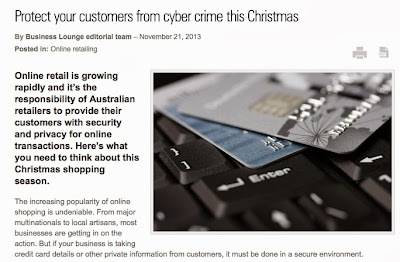 "Protect your customers from cyber crime this Christmas"
THE HARD WORD is one of Australia's busiest and most successful media consulting and freelance writing businesses. Feature articles from its writers Chris Sheedy and Jenny Bond are regularly published in the country's bestselling magazines and newspapers, as well as in major international titles. THE HARD WORD is often engaged by leading brands and businesses including banks, universities, fashion institutions, media houses and finance companies for various purposes including media consulting, PR, professional writing services, book authoring, media training, annual report production and magazine/brochure/web editorial production. Chris Sheedy is a corporate writer, journalist, author, copywriter, media consultant and content marketer with over 20 years of industry experience in print, TV, books, radio, PR and online. He is a published non-fiction author in Australia and the USA. Jenny Bond is a fiction and non-fiction author who has been published in Australia, Germany and the USA. She is currently completing her fourth novel. "Chris provides concise, interesting and accurate copy, on time, every time. If there were more freelancers like him, we’d have a significantly higher standard of magazine journalism in Australia. Unfortunately, there are not." The official author site of Jenny Bond, one of two directors of THE HARD WORD and now an internationally published author of fiction. All content © Copyright 2013: The Hard Word Pty Ltd. Simple theme. Powered by Blogger.